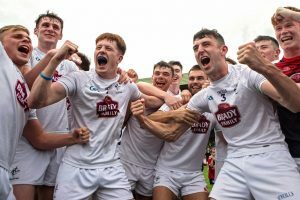 KILDARE’S Under 20’s turned in one of the all time great Kildare GAA performances to beat Kerry at underage level for the first time since 1966 and qualify for the All-Ireland final today at the Gaelic Grounds in Limerick. Both sides contained almost double figures of survivors from when these two sides met in the minor All-Ireland semi-final two years ago. That day in Croke Park Kerry won by 22 points. Under the brilliant management of Davy Burke Kildare turned that result on its head. Within an outstanding team performance, Jimmy Hyland again led the way and finished with a personal haul of 1-8, to follow on from an eight point display against Dublin in the Leinster Final. He was far from the only hero on the day for Kildare. There were more than echoes of Dermot Earley or Kevin Feely in Aaron Masterson’s magnificent midfield display. In the backline, all six defenders were again immense and goalkeeper Aaron O’Neill made a crucial save at a vital time in the first half. Up front, Brian McLoughlin got the better of the highly rated Stefan Okunbor, while the others worked their socks off. The last of Hyland’s personal haul, and Kildare’s last point in the game, came in the 54th minute and put them seven points clear but Kerry came storming back into the game late on. Substitute Michael Potts hit the Kildare net with his first touch in the 57th minute to spark an unanswered run of 1-3 for the Jack O’Connor managed Kerry team and leave Kildare hanging on by their fingernails. Despite the late drama, this was a deserved win for a Kildare side who were led from midfield by their captain Aaron Masteron. Hyland’s fifth point moved Kildare into a 0-9 to 0-5 lead in the 24 minute but Kerry finished the half strongly and a couple of Fiachra Clifford points helped them cut the gap back to one by the break. Paddy Woodgate and Donal O’Sullivan swapped points early in the second half but in a crucial period midway through the second half, Kildare scored an unanswered 1-3. Fittingly, it was Hyland who netted the goal after 47 minutes after Ruadhan O’Giollain intercepted a Stefan Okunbor free kick and fed him with a pass. Kildare only scored one point in the final 13 minutes of normal time plus six added minutes but they held on to record a famous win. This was the 20th All-Ireland semi-final that a Kildare senior, under 21 or minor team have played since the last All-Ireland glory at any of those levels way back in 1965, this was just the sixth win. Mayo on 5 August now stand between Davy Burke and his team claiming national glory. Kerry: F Clifford 0-5fs, M Potts 1-0, D O’Sullivan 0-2fs, C Linnane 0-1, B Friel 0-1, B Sweeney 0-1, G O’Sullivan 0-1, M Ryan 0-1, S O’Leary 0-1. KILDARE: Aaron O’Neill; Mark Dempsey, Mark Barrett, DJ Earley, Darragh Ryan, Jason Gibbons, Tony Archbold; Aaron Masterson, David Marnell; Stephen Comerford, Padraig Nash, Ruadhan O’Giollain, Jimmy Hyland, Brian McLoughlin, Paddy Woodgate. Subs: Shane O’Sullivan for Marnell, h/t; Mark Glynn for O’Sullivan, 35; Jack Bambrick for Ryan, 38; Cian Costigan for Nash, 44; Sam Doran for Woodgate, 54; Niall Murphy for Hyland, 60+2. KERRY: Brian Lonergan; David Naughton, Stefan Okunbor, Micheal Reidy, Mike Breen, Graham O’Sullivan, Daniel O’Brien; Mark Ryan, Diarmuid O’Connor; Fiachra Clifford, Eddie Horan, Dara Moynihan, Donal O’Sullivan, Bryan Sweeney , David Shaw. Subs: Sean O’Leary for Naughton, 37; Brian Friel for Horan, 49; Cormac Linnane for Shaw, 51; Micheál Foley for Breen, 53; Michael Potts for Clifford, 55; Cian Gammell for Ryan, 57.